Introduction: Plano has been in the plastics molding business since 1952 and continues to be a dominating force in the storage systems for outdoor activities. We take a look at the Magnum 1119-05 to explore some of the advantages and disadvantages it offers fresh and saltwater anglers. Impressions: The Magnum is built tough. The entire frame is built from molded ABS plastic and is extremely durable. In addition there are almost no moving parts, just two lids held in place by 4 pin hinges. One advantage of the Magnum is that the lids are transparent so anglers can easily locate the right piece of tackle quickly. For Freshwater anglers: The Magnum has ample storage space for most anglers who don't go overboard with too much tackle, but lacks the ability to be quickly customized. So if you are like us and like to fish for different species of fish you have to pull everything in and out depending on your trip. In addition anglers that like to walk the shore tossing lures will find the Magnum far too cumbersome. Unless you are willing to put the entire box in a backpack there really is no way to hold onto the box and fish at the same time. 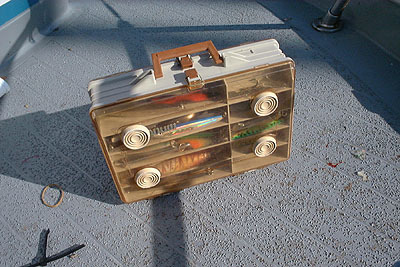 The box is useful for freshwater boat anglers who need a quick box to draw from. For Saltwater anglers: The Magnum seems much more at home in the hands of saltwater anglers. The construction is durable enough to take a beating on and off shore. One side of the box has smaller compartments that are good for weights, swivels, and hooks. The other is ideal for large diamond jigs and big game cranks. Real World Test: For saltwater shore anglers the Magnum's strength comes from the ability to hold a large volume of weights and lures, but the inability to carry the box and fish simultaneously still is an issue. 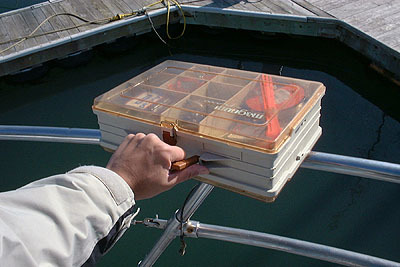 The perfect application for this box is on personal and charter boats. We have used the Magnum on over 10 trips out to the ocean fishing for a combination of Rockfish, Salmon, Albacore, and Barracuda...in San Diego. When we went fishing for Barracuda in San Diego last year we actually went out on a charter that offered a "free for all," which basically means you can go out there and fish for Sea Bass, Barracuda, Rockfish, anything that swims is fair game. So we were forced to load a ton of varying tackle into the Magnum. The overall volume the Magnum can hold is impressive, and the compartments separate everything efficiently. On the first few trips we noticed an inherent problem with the Magnum on all the charters. In rough water when the boat tossed back and forth the box would slide across the deck. A couple of times I thought the box was going to flip right off the deck into the ocean! We addressed this issue with a quick and easy modification that can really apply to any box. We procured 4 rubber feet and epoxy from Orchard Supply Hardware and affixed them to one side. (A total cost of only 6 dollars) The box not only doesn't move now but is actually strong enough to double as a small seat to avoid resting on ocean sprayed decks. We continue to use the magnum each and every time we go on charter trips. The size of the box is adequate for weekend trips, and the durability is outstanding. You can stand on this box and it wont break! Two things that would have made the magnum more attractive are if one side had adjustable compartments so odd sized tackle could be accommodated, and a optional shoulder strap could be useful to carry this box when loaded and/or carried for an extended period of time. Conclusion: Overall the Magnum is a great box for boaters, but has limitations for anglers on the shore. Walking with the fully loaded box over long distances is difficult because all the pressure is put on one hand. Bass fisherman may find the Magnum too limiting and may opt to go with a soft bag with modifiable contents. Where the Magnum really excels is on boats where you don't need to worry about carrying it, and can quickly locate and pull out lures with ease.